It’s one of the biggest phobias out there for small businesses – glossophobia, or the fear of public speaking. To stand up and present in front of a room full of people and do it well is difficult, but with some preparation and practice you will start to enjoy it. This article will walk you through how I put together a presentation on branding for a recent event, some advice on presenting and finally the full presentation to view or download at the end. The first time I stood up and presented a talk was at a local network meeting in front of a group of business people. I was a bag of nerves – fearful but excited. I was stepping out of my comfort zone – but I knew I had to do it to overcome my fear. As part of the networking group, I had been given some training on how to present. That helped. But as a designer, my presentation had to be designed and look perfect, so preparing and tweaking it took longer than most presentations. Now, after a few talks under my belt, I still get the nerves but I am more confident and now enjoy talking about a subject I’m passionate about. The reality is that beautifully designed slides are only really half the presentation. It’s all about how you engage with the audience on the day and not just repeat every word on the Powerpoint. If you’ve ever sat through a ‘Death by Powerpoint’ presentation, you’ll understand what I mean? The slides are really there as a helpful visual cue to guide you, and the audience as you talk. So to make your audience feel at ease and relaxed you also have to relax (or look relaxed! ), prepare your presentation well, and practice the timings, and your presentation will go more smoothly and you will start to enjoy it. As a designer that specialises in branding and logo identity design I regularly write articles around branding and I also send out regular, monthly newsletters. Through these newsletters, I was invited by the marketing manager of a local school to talk at one of their small business breakfast events. There were around 35 people invited – from small business owners, organisations, a few councillors and even the Mayor of Bath, (who was an ex-designer). The presentation had to be simple, easy to digest and be around 20 minutes in length. So I decided to base the presentation talk on a few of the blog articles I had written recently on branding and identity, What is a Brand?, Is your brand identity working as hard as you are?, and Creating a Brand Story in Design. In essence, my talk was about what a brand is, what makes a great brand identity (triumphs and disasters) a few branding do’s and don’ts as well as showing some examples of logo designs and brand guidelines. Even though I had the content, I still had to do some further research and tie it all together. I also regularly watch online videos of great speakers for inspiration. TED talks are one valuable source to watch the professionals do it – and are completely free. Also, have a look at other presentations based around your subject matter. 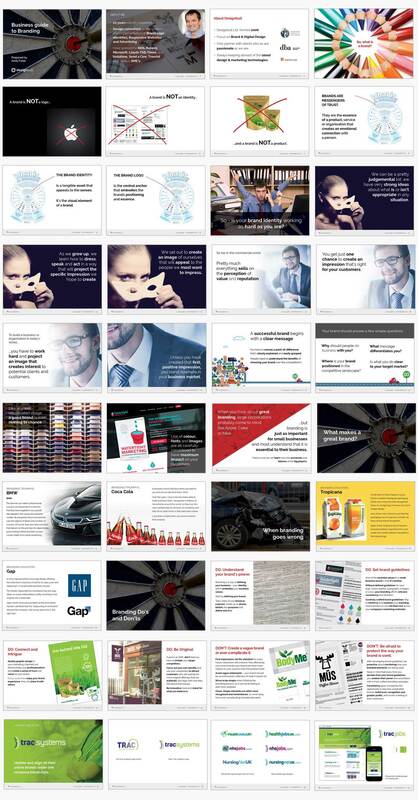 Slideshare is a great resource – and you can download some as templates for your own to try out. When it comes to preparing and presenting a branding talk, you may think as I’m a designer that it should be easy to create? But that’s not the case. For any subject matter you base your presentation talk on, it’s all around making the complicated simple. Breaking the information down into easily digestible chunks and still get the message across. Keeping it simple. And this can take more time than you first realise. It took me a full two days in total preparing, sketching and designing my presentation talk, then another few hours practicing and refining it the night before the talk. 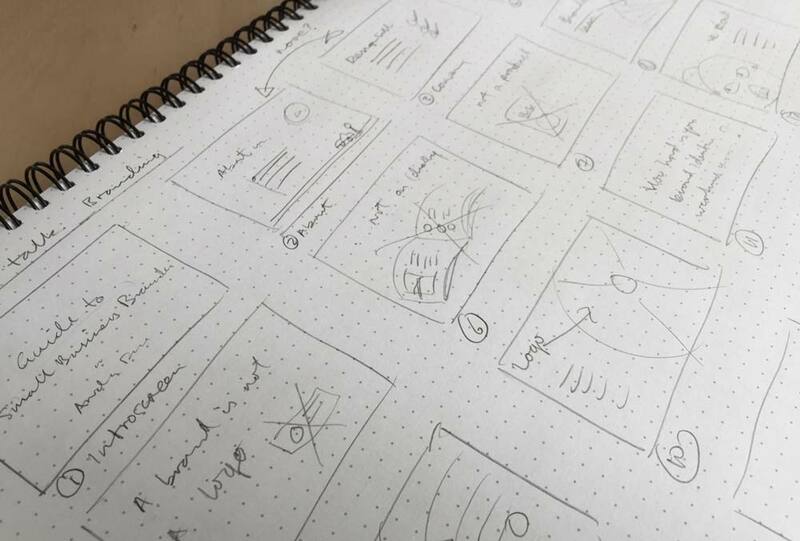 Before you dive onto your computer, sketch out the thumbnails of each slide to give an idea how the presentation content looks overall. This makes it easier to play around with the format of your presentation and get a rough feel of a beginning, middle and an end. If you’re an expert at PowerPoint, Keynote, Prezi or any other presentation software, then putting together your content into these should be easy for you. If you don’t do many presentations, then you may spend an enormous amount of time learning or ‘wasting time’ with them. I’m OK at putting together presentation designs for clients in PowerPoint, Keynote and Prezi – with animations and whizzy stuff – but I wanted to focus on the content with the short time I had. For this brand presentation, I used Adobe InDesign. It’s a programme I work with on a daily basis and I know it so well, which makes it much easier to tweak and refine pages. I can also quickly print out pages as thumbnails and see how the presentation looks overall. It has no animations, music or video – tempting as it may have been, as I could have used some of these ‘shiny things’ – but this presentation and each slide needed to be simple. My thumbnail presentation designs. Let the content for each slide be clear and easy to read, while you focus on the talking. This is essential in getting it right on the night (or day). Once you’re happy with your presentation design, it’s time to practice. Do it on your own first with a timer. Then in front of your pet cat – or your partner or friend if possible. This will iron-out any faux pas’ in your delivery. You’ll find some slides may need editing, moving around, taking away or even adding to. I presented on my laptop directly through InDesign (Shift W) so it made editing on the fly quicker. Don’t assume that the event will have the latest tech, ready for you to plugin your laptop and away you go. I brought along my own projector, my laptop and connectors as a back up in case of any ‘IT’ issues. Most of the time, this won’t be an issue, but it happened to me at a previous talk. They had a projector – but the connections to the laptop were at the back! I assumed I would have my laptop in front of me with my notes on screen. Luckily the venue printed out my notes at the last minute. 6. Don’t be afraid to add or change things on the day. My branding talk was at a school breakfast event, as part of their connecting with local businesses theme. From listening to people before at the networking slot and the introduction talks by their head teacher and marketing manager, I weaved into my talk a couple of examples that related to the audience that day. There were mainly small business owners so, as I’m a small business owner, I talked about how hard it is running and marketing my business. 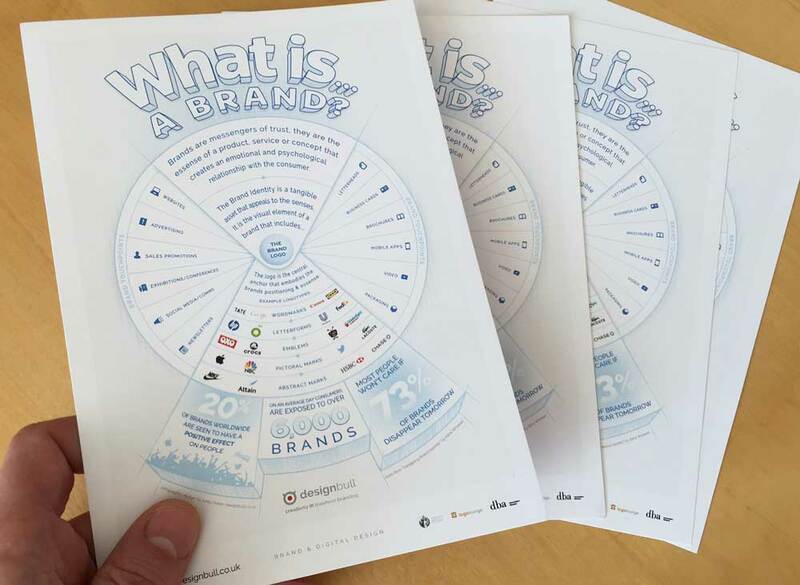 As a visual aid for the audience, I had brought along printed hand-outs with my infographic What is a Brand? printed on them. I handed them out with their packs and were a useful reference for them to take away after the event. Finally, always prepare for audience interjections – or hecklers. Everyone has their own opinions, (some like to speak their mind!) but keep a brave face and answer honestly, with a smile. If it starts to take too long, politely ask that you continue discussing it after the talk ends. It makes you comes across as a professional and keeps you in control of your talk. End your talk by thanking the organiser, then provide an opportunity for any further questions from the audience. I hope you found this useful? Have you any interesting tips or advice? I’d love to hear them so feel free to add your comments at the end. You can also download my full branding presentation PDF by clicking the button below. This entry was posted in Branding and tagged brand talk, fear of public speaking, how to present, presentation.